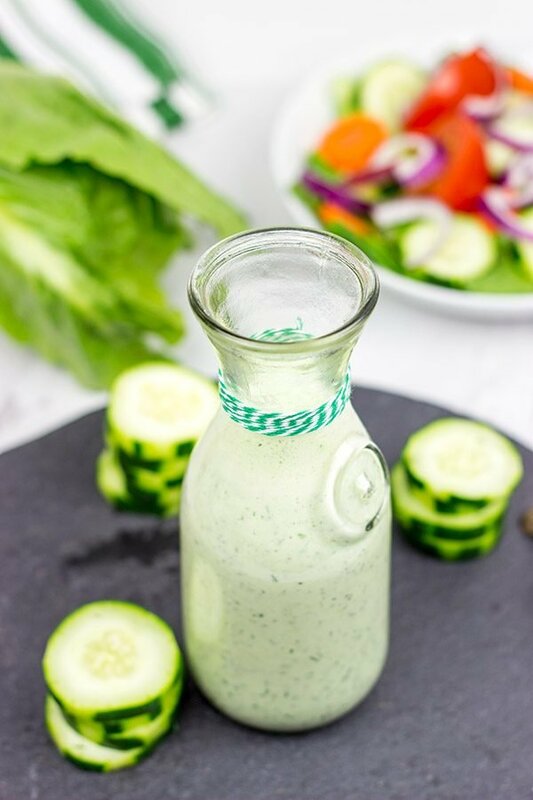 This Creamy Cucumber Dill Dressing is a quick and easy dressing for fresh summer chopped salads! “Hi, my name is David. Would you like some dill?” I’m seriously thinking this is how I should start introducing myself. We’re overrun with fresh dill here! And unlike our garden adventures, where I always (always!) plant too much basil and jalapenos, the dill is actually growing indoors. In fact, the dill was a Christmas gift from Laura this past year, and it’s a gift that just keeps on giving. Huh? What was that? Dill as a Christmas gift? You see, Laura got me one of those indoor herb growing machines for Christmas this past year. I love it! I’m always looking for fresh herbs either to use in a recipe or to garnish a dish, so a self-contained kit that grows fresh herbs year-round? Perfect for me! And get this…I actually have my fresh herbs growing on a side table in our basement. The LED lights come on and off on a timer, so there’s actually no need for sunshine. And no need for dirt either. It’s about as easy as possible. Perhaps too easy. I planted the kit right away after the holidays, and the dill just took off. I did a bunch of reading online about how to prune dill, and it turns out that frequent, small prunings are the way to go. So every couple of days, I snip off the new growth. I felt guilty just throwing that fresh dill away, so I started storing it in a plastic bag in the fridge. Well, before long, that plastic bag was jam-packed with dill. I had to come up with a way to use dill…and quickly! 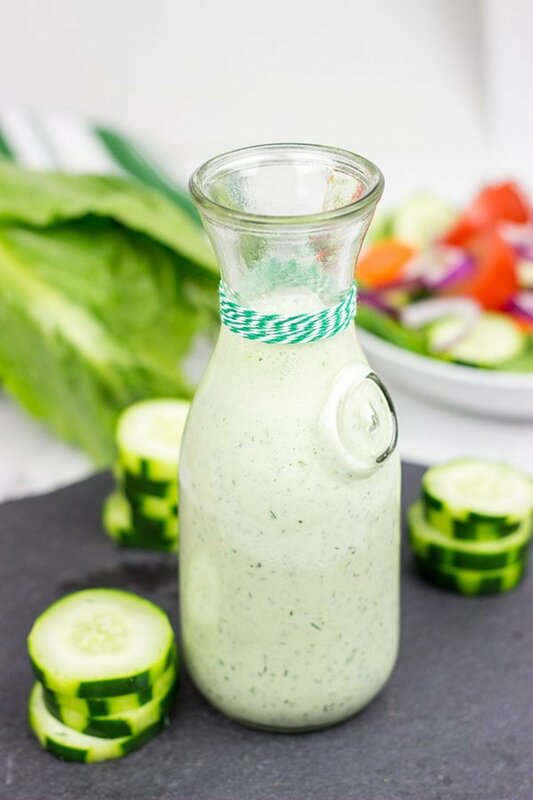 Laura suggested a salad dressing, and so this Creamy Cucumber Dill Dressing was the winner. And it’s delicious! We use dill quite a bit in the summer as tzatziki is one of our favorite sauces to serve with grilled meats. (Case in point–these Mediterranean Meatball Kabobs or these Chicken Souvlaki Skewers.) I felt like I was picking up a pack of fresh dill at the store almost weekly. Never again! 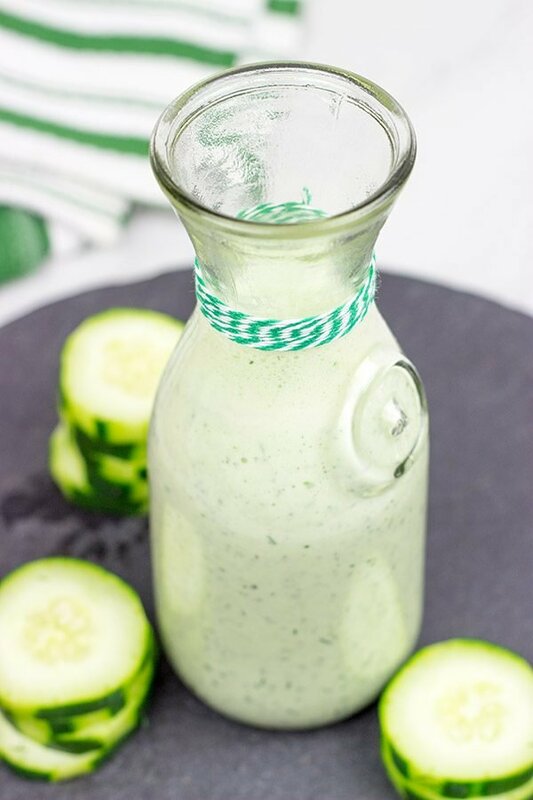 Now I have enough dill for a small army…or a really big batch of this Creamy Cucumber Dill Dressing! In the meantime, you can find me pruning my dill plant. Next up: dill pickles…or maybe dilly beans…or hanging it in my doorway to scare off witches. Cheers, friends! Slice the cucumber lengthwise and use a spoon to scrape out seeds. Place cucumber in a blender or food processor; pulse until chopped. Add all of the remaining ingredients (green onions, yogurt, sour cream, garlic, lemon juice, vinegar, dill, salt and pepper) and blend until well combined. I’d totally take some of that dill off your hands if I could. It’s easily one of my favorite herbs. Have you ever tried Ina Garten’s potato salad? It’s PACKED with dill and soooo good. I have a feeling I’d just eat this dressing with a spoon. . .Have a great weekend! Oh man, I wish you could take some of this dill off my hands, Kelsie! I actually had to cut one of the plants all the way back…I was pretty sure it was about to take over my basement. Imagine something like Little Shop of Horrors. But with dill instead. Haha! I’ve never tried Ina Garten’s potato salad, but it sounds like something I need to go look up! Thanks for the recommendation, Kelsie! I actually posted about Ina Garten’s dill potato salad! I loved the recipe! A definite must try! Interesting! Another vote for that dill potato salad. I’ll have to check it out now! Hi David! This will be perfect for the salad I’m serving tomorrow with steak and shrimp! Our garden is producing cucumbers like crazy! I have twenty sitting in the frig to make pickles. I assume you peeled the cucumber. Have you ever made dilled asparagus? It’s really good to put a spear or two in a Bloody Mary (or just to eat). Have a great weeked! Hey Dorothy! Man, your menus always sound so delicious down there. Makes me want to drive south just to get a taste! 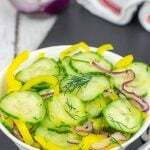 🙂 So this one came about because of our surplus of dill, but it would be a good way to use up extra cucumbers, too. I actually didn’t peel the cucumber first. I blended it up, and the little flecks of green you see in there are the cucumber peel. You could peel ’em if you want, but no need! Just make sure to scoop the seeds and watery portion of seeds/flesh out…otherwise the dressing might be too thin. Oh, and great idea about dilled asparagus. I’ve never tried it, but it’s on the list now! Oh, I love this game. “I’m Ben. Would you like some lavender?” I thought your bunnies eat everything except jalapenos in your garden. Don’t they touch basil? And you know what? Last birthday (which was just after the Christmas holidays) Andrey got this LED growing machine. We’ve found that some herbs (like basil and thyme) grew much better than parsley and dill. But right now he’s growing cherry tomatoes, and it looks we’ll have a vegetable salad soon 🙂 And this dressing? Love it. 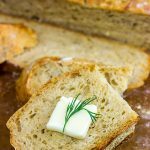 It’s fresh, light, delicious, and paired well with many dishes! Actually, no, the rabbits have left the basil alone…so we always end up with tons of basil at the end of the year, and I turn that into a bunch of pesto that we freeze. Interesting that dill didn’t grow as well for you. It has taken off in our machine, and I swear it’s about to take over the basement. I’ve never seen dill with such a thick stalk! I haven’t tried tomatoes in the LED machine yet as I figured it wouldn’t be enough of a return…herbs go so much further. But let me know how the tomatoes work out? I might have to try them sometime! Thanks, Ben! 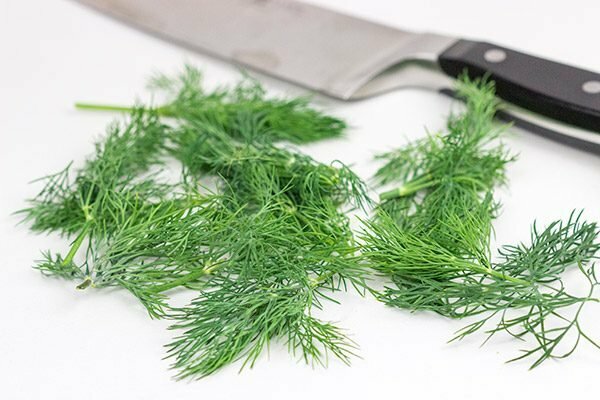 I always associate dill with fish, so im loving how you used this herb to make a delicious salad dressing! We’re having a beautiful heat wave here in Englsnd right now and ive been searing for new salad dressing (as im a creature of habit and need to fix that!). Ill be trying this for sure! Thanks David! You know, I often associate seafood and dill together, too. But we have SO MUCH dill right now that I had to find other ways to use it up…and this dressing is seriously tasty, Lucie. I love summer salads, but I’m like you. I have to mix up the dressing so I don’t get too bored eating the same thing. Give this one a shot. It’s delicious! Thanks so much, my friend, and stay cool over there! I love growing herbs and having fresh herbs on hand. I love the taste of dill and I”m sure this dressing would be a hit in my house! It would be perfect on salads and as a dip. I think this dressing would be perfect for smoked salmon with capers! I can’t wait to make your recipe! Ooo…that’s an excellent idea, Kelly! I’ve been using this as a salad dressing, but it would be so tasty drizzled over salmon, too. Excellent idea! Sorting my garden out is one of my key jobs at the moment David as I’m keen to make more use of it. I’ve certainly been inspired by your writtings here to do that. And I must admit I absolutely love your indoor herb garden too. #gardenjealousy. I just wondered if it were cat friendly? I fear our cat, Begbie would tear it to shreds!! So, feel free to keep me any of your spare dill. Although it probably wouldn’t survive a trip over the Atlantic either! A great recipe and a great use of Dill David. I love it! You totally need to sort that garden out, Neil! I’ve been excited to hear about your growing adventures this year. And you should consider the indoor garden, too. It’s a bit of an investment, sure…but it’s so fun to always have fresh herbs on hand. Right now, I’ve got several Thai Basil plants going that I started from seeds. (Laura loves to make Thai food.) I suspect the cat might take a liking to the indoor herb garden…but the cool thing is you could literally put this thing in a cabinet (as long as you have a place to plug it in). In the meantime, I’ll just send you weekly packages of all my extra herbs. You’ve been warned. It’s a lot! 🙂 Thanks so much, my friend! I’ve never heard of an herb growing machine. I’m going to have to look into that. I’ve also never had cucumber dressing. I’m sure I would love it! Thanks for the recipe. You totally should look into the herb growing machine, Jeff. It was a fun Christmas present last year, and it works incredibly well. I finally chopped down the dill as it was about to take over my basement table. I replaced it with Thai Basil (from seed) since Laura likes to make Thai food…and now we’re overrun with Thai Basil. (I can’t find fresh Thai Basil around here, so I’m ok with that.) Oh, and this dressing? Tasty! Perfect for summer. Cheers, my friend! This dressing sounds yummy! I like growing herbs, too. I have a covered front porch so in the summer I have a variety of herbs growing in pots there. Yes! Growing herbs is a lot of fun…especially because they grow so quickly. This dressing totally came from having too much dill, and it turned out quite well. Thanks, Dawn! David we were in NYC last week for a trade show thingie, if I had known you were overrun with dill, I would have parachuted out of the plane to take some of that dill off your hands had I known it scared off witches – dang – next time! Wait! Did you go to the fancy food show!? I was thinking about going (and even registered), but then I had something pop up here in town and I had to cancel. If I had only known! I could have brought you more dill than you know what to do with. 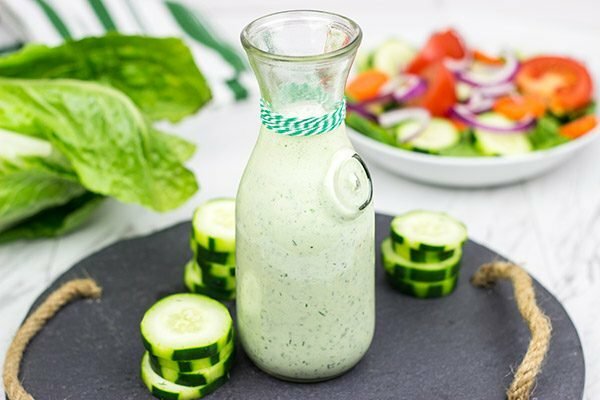 🙂 You could have had enough of this cucumber dill dressing for the rest of the summer…and then some! Good to know about the fancy food show. It was going to be a bit of a hassle to get there as it’s a 3+ hour drive each way for me…and on a weekend. I was wondering what the show itself would be like. Now I know. But Robert Irvine is cool, though! Thank you so much, Sherri! 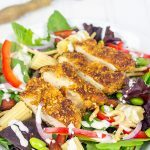 This dressing came about thanks to an overflow of dill here…but I’m glad I had all that dill as this dressing is super tasty for summer salads. Thanks so much, my friend!